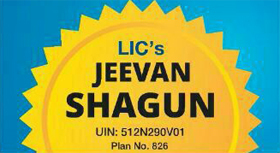 LIC Jeevan Shagun table 826 is new plan by LIC on 58th Anniversary. Jeevan Shagun is non-linked, with profit, single premium close ended money back plan. Jeevan Shagun is available for maximum 90 days from 1st Sept, 2014. 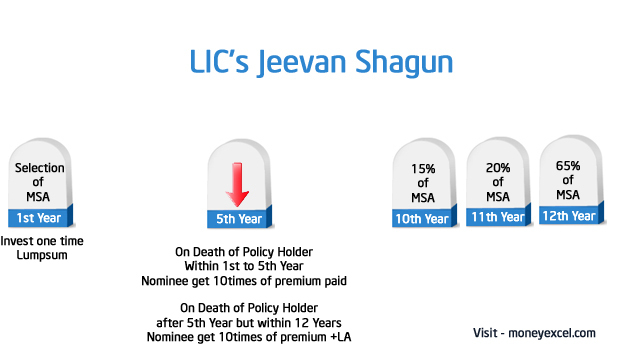 Let’s take a quick look at LIC Jeevan Shagun policy. Jeevan Shaugn provides risk cover and money back benefit to policy holder during term of the policy. Sum assured is fixed and decided at time of taking policy. Basic Sum Assured i.e. 10 times of the single Premium Along with Loyalty Addition if any. If policyholder survives money back benefits are payable as below. At the end of 10th Policy year: 15% of the Maturity Sum Assured. At the end of 11th Policy year: 20% of the Maturity Sum Assured. At end of the Policy Term 65% of Maturity Sum Assured along with Loyalty Addition is payable. Jeevan Shagun can be surrendered at any time during the term of the policy. If the Policy is surrendered during the first year from the date of taking the policy 75% of Single Premium is paid back. Yes you can avail loan benefit for this policy. Above premium includes service tax. You can download premium ready racknor here. Should you buy Jeevan Shagun? Jeevan shagun is typical non-linked money back close ended plan. As it is closed ended plan once you buy this policy you have to stay invested for 12 years. It is like 12 year fixed deposit with additional benefit of risk cover and partial money back benefit. Let’s try to compare this policy with fixed deposit. If you look at above comparison fixed deposit surely beat this plan in terms of returns, but in fixed deposit returns is taxable (As per tax slab) while Jeevan Shagun is expected to give tax-free return. On and average if you are happy with 7-8% return like FD than you can think of purchasing Jeeavn Shagun which gives you additional benefit of risk cover. Can I take by paying premium for Jeevan Saghun on line using Credit Card….? No, You need to fill-up application form for purchasing this policy. LIC gives facility of online premium payments but that is for renewal only.